3. We notice time outs in our OpenSim.exe console every few minutes.. though the map tile refresh is set to one hour. 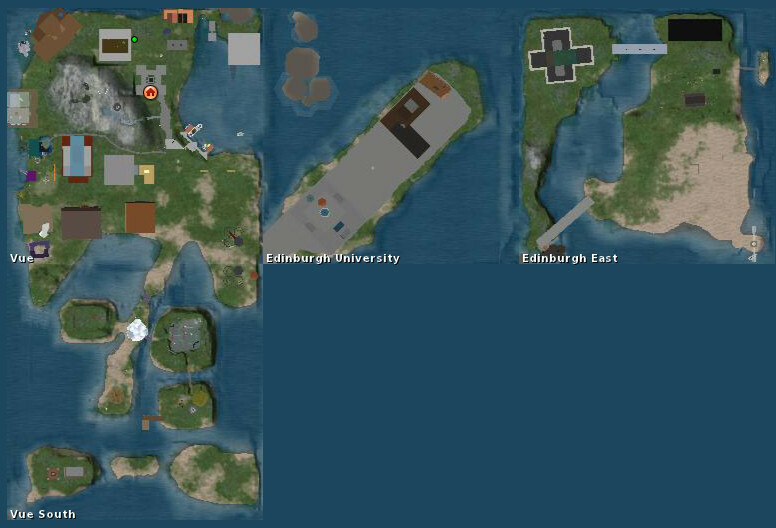 As a comparison see the diagonal road through the middle of the regions as shown in the Second Life map image. Its basically the same as shown as a set of non-rotated squares on the Warp3d map images. Also worth noting that some of the buildings do render as a much more accurate shape on the Warp3D image though. Re point (2).. 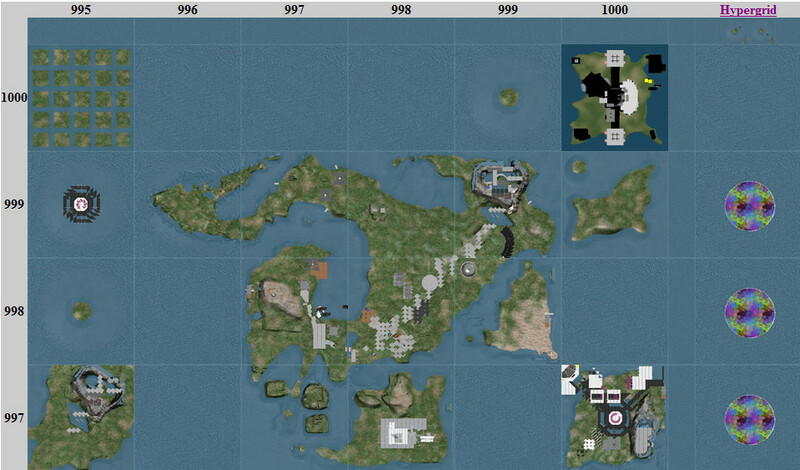 I think I can see the map tuile being refreshed for the 4 regions on the OpenSim.exe instance. 3 of them show up with changes. the "default" poprt 9000 one does not change even though a new map tile UUID has been created and the old one apparently deleted. SubNote: MemLeak continues if maptile refresh is used. It will update anyway when region instances are re-started. Best to set the rate to 0. On win you may not notice it as a problem for quite sometime as caching tends to hide it. On linux you will see mem top inc. overtime. Im thinking some of the timeout may be related to that. On win if your want to see the issue, sw to ram cache rather than disk. Will fill it up past max quickly. With flotsam it takes mutch longer b4 you see the effect. Might try and sw tile refresh = 0 and see if matters. samian, thanks for that warning, we did have Flotsam caching on. We had refresh rate set to 3600 secs, but for now will set to 0 and just do an occasional restart to get new maps. Though as I said my default region is actually not updating at all (so far as visible result goes, though console trace seems to indicate it might be doing so). Do you see that issue? Re point (1) I note that the non-rotated prims on the map tile are ones in linked sets. Single rotated prims seem to have their rotation properly shown. Re point (2), after a second OpenSim.exe startup (to put in place the changed refresh period 3600 -> 0) the map tile that had not updated on first startup, and through its refresh periods was updated and is now showing the correct Warp3D generated tile image. Thanks LaniGlobal, I had seen your excellent eport and experioments before. the new Warp3D renderer does a MUCH better job of renderign the prims and they are all sized and coloured I think correctly. There seems to be an issue with rotations of some linked prim sets and if this was fixed we would be in great shape visually. I have one link set in my grid - a cabin. It is drawn improperly rotated on my map. There was a change to the maptile renderer in r09bf9d5fca8e that should produce better results on the position issues. I tried r/14307 today and note this error showing in the OpenSim console. could it be a result of recent patches? 2010-11-01 09:17:52,394 ERROR - OpenSim.Region.CoreModules.World.Warp3DMap.Warp3DImageModule [MAPTILE]: Failed generating terrain map: System.ArgumentException: Parameter is not valid. When I run OpenSim.exe a second time I then get different yellow warnings.. but presumably from the same error. 2010-11-01 09:21:56,973 WARN - OpenSim.Region.CoreModules.World.Warp3DMap.Warp3DImageModule [MAPTILE]: Error decoding JPEG2000 texture 8fb6edf2-6d60-4d2e-aba6-de2807cdce91 (24600 bytes): Error while reading bit stream header or parsing packets. 2010-11-01 09:21:56,987 WARN - OpenSim.Region.CoreModules.World.Warp3DMap.Warp3DImageModule [MAPTILE]: Error decoding JPEG2000 texture b4fad7a3-894b-4ad6-b8de-b372e826e502 (7600 bytes): Error while reading bit stream header or parsing packets. I see the same error message on the console, although the map tile is being generated according to the database. I agree.. the map tile was generated in my tests before I had to roll back due to the newly introduced errors. But, as Teravus expected in this change to the Warp3D maptile renderer in r09bf9d5fca8e, it the map tile images look much better now that each prim in a linked set is properly handled for position and rotation. I think these three errors are not present in recent OpenSim 0.7.1. dev versions.